Rich Weaver, 25, stocky, dapper in double-breasted blazer, yellow razor-styled hair in place despite the breeze, stands on a wooden platform in the shadow of the California state capitol columns, alone but for a battery of microphones. He squints in the mid-day glare, surveying the scene before his eyes. A quarter-mile away, thousands of young people massed into ranks are heading towards the capitol mall where Weaver is waiting. he hears them singing, only faintly; and he sees the placards they wave, too distant to read, though Weaver knows them by heart. They say; "Jesus Loves You," "Jesus Lives," "Dynamic Duo; You and Jesus." He adjusts a cuff link and clears his throat; now the procession is much closer. Here and there Weaver can distinguish a rapt face, Jesus on their lips. then the parade reaches the edge of the mall and the first ranks of marchers, pressed from the rear, rush the last few yards to the capitol steps. Suddenly, the plaza is alive with kids, and the late-comers overflow onto the capitol lawn. Looking down into the swarming mass of faces from his wooden island, Weaver comes to life, grasping the microphone, and cries: "They're still coming, they're still coming, Can you believe the revolution is on?" A murmur from the crowd. All eyes turn to Weaver, everyone anticipating what will follow. A hush. "What revolution?" Weaver inquires casually, waiting to hear. "The Jesus Revolution," roars back the crowd, and Weaver becomes more animated, eyes blazing, darting from face to face. "That's right! The revolutions of hate and drugs are antiquated revolutions. it's time for a spiritual revolution. it's time for Jesus people to carry the banner high and scream it -- 'Jesus is alive' -- up with the Jesus revolution!" With the young supplying the Jesus movement's style and language, it's no wonder that a sizable Christian rock-gospel scene should have emerged. One entire band in the Northwest - Wilson McKinley - recently declared for Jesus. 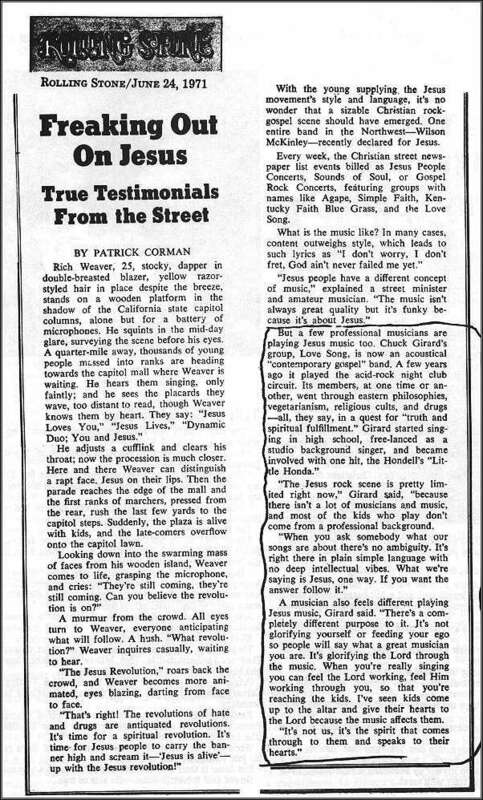 Every week, the Christian street newspaper list events billed as Jesus People Concerts, Sounds of Soul, or Gospel Rock Concerts, featuring groups with names like Agape, Simple Faith, Kentucky Faith Blue Grass, and the Love Song. What is the music like? In many cases, content outweighs style, which leads to such lyrics as "I don't worry, I don't fret, God ain't never failed me yet." "Jesus people have a different concept of music," explained a street minister and amateur musician. "The music isn't always great quality but it's funky because it's about Jesus." But a few professional musicians are playing Jesus music, too. Chuck Girard's group, Love Song, is now an acoustical "contemporary gospel" band. A few years ago it played the acid-rock night club circuit. Its members, at one time or another, went through eastern philosophies, vegetarianism, religious cults, and drugs -- all, they say, in a quest for "truth and spiritual fulfillment." Girard started singing in high school, free-lanced as a studio background singer, and became involved with one hit, the Hondell's "Little Honda." "The Jesus rock scene is pretty limited right now," Girard said, "because there isn't a lot of musicians and music, and most of the kids who play don't come from a professional background. "When you ask somebody what our songs are about there's no ambiguity. It's right there in plain simple language with no deep intellectual vibes. What we're saying is Jesus, one way. If you want the answer follow it." A musician also feels different playing Jesus music, Girard said. "there's a completely different purpose to it. It's not glorifying yourself or feeding your ego so people will say what a great musician you are. It's glorifying the Lord through the music. When you're really singing you can feel the Lord working, feel Him reaching the kids. I've seen kids come up to the altar and give their hearts to the Lord because the music affects them. "It's not us, it's the spirit that comes through to them and speaks to their hearts."